I’ve decided to branch out and try a new site for selling my handmade stuff. I’m giving Big Cartel a shot as I’m not sure I’m on board with all the changes that have been happening over on Etsy. Things were great until they opened it up to the wholesalers and the people who can sell “handmade” items that they bought for pennies from China. Makes it hard for people who actually put time and effort into making their items to sell and make money when others can offer the same thing for cheap. Anyway, here’s my new shop. Sarandipity Handmade. I’m still going to use Etsy for a while, but I’m just testing the waters. Several of my friends have made the move over to Big Cartel and love it, so I’m hoping I (and you) will, too. 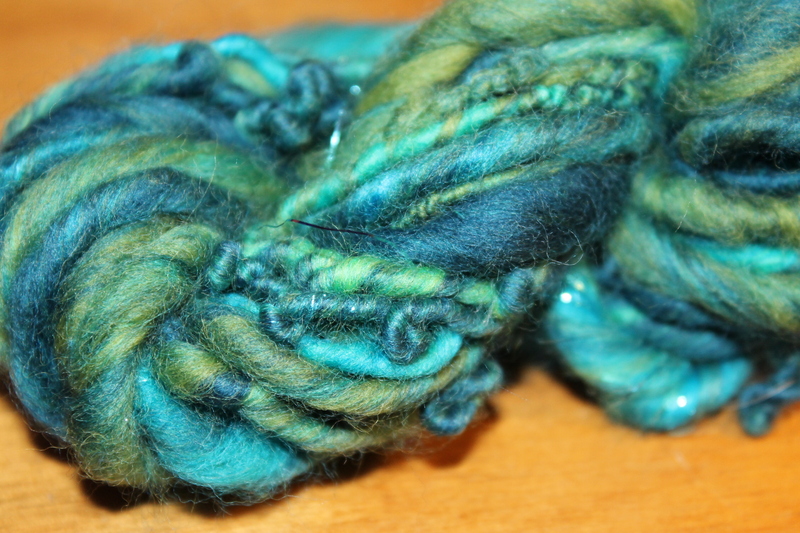 My first listing on BC is for my newest handspun yarn – Lollipop Guild. 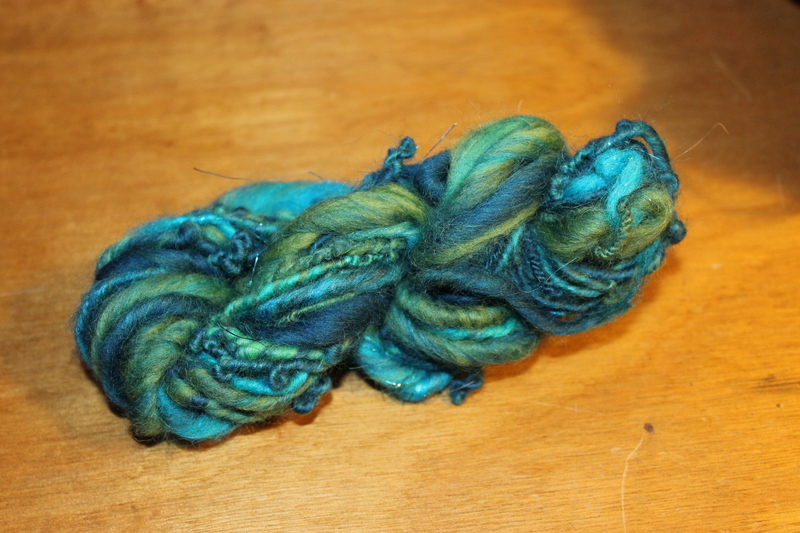 This is spun from a braid of Organic Polwarth that I dyed with bright green, purple, red and brown. It’s a 3 ply, navajo ply and approximately a worsted weight/heavy weight. There are 2 skeins of this and you get both (I had to split it because my bobbins are small and I can’t fit all 4 oz on at one time). There is a total of 124 yards and 4oz/119g. I just love the fun colors of this yarn and hope you will, too. I’m also hoping that I’ll have more time to start blogging again, so watch this space for more shop updates and more crafty stuff. I’ve got some things planned that I want to work on for the upcoming Madison Street Fair in September so I’m hoping to blog about that, too. Spring is finally here, though you wouldn’t really know it by looking outside. It’s very dark and dreary with a fine rain falling on the layer of sleet that fell yesterday. Hopefully, the weather will start improving, the buds will start popping up and Mother Nature will show her true beauty in all the flowers and green leaves. I’m looking forward to the snow going away! I’m also hoping that I won’t need all the winter woolies anymore. Though, that will make me kinda sad as I just finished a pair of fingered gloves for myself. I’m loving the colors (black, red, green with a hint of white and blue) and they match my winter coat and hat perfectly (well, the black and bright green do anyway), but I’m kinda sad that while I made them to fit me perfectly, they have stretched a bit with wearing them a few times and now feel like they are floating on my hands. They are still warm, though and I’ll either keep them or give them to Darling Hubby if he’d like them. I was considering making them with a mitten flap to go over the fingers, but I don’t think I have enough yardage leftover to do both flaps…Oh well. I haven’t been spinning since the Ravellenics ended in February (geeze, that was a month ago almost!). I went to Open Spinning at the LYS last night and finished up the 2nd skein of my X’s and O’s worsted weight Navajo plied yarn. It felt good to finish something. I finally washed the first skein of X’s and O’s and the skein of Ten and Tardis singles that I spun. Now I’ve got 3 skeins of yarn drying. I’m hoping the weather improves so I can get out on the porch to photograph. The dark and dreary light of today isn’t great for photography…and my attempt at making my own light box was a failure. 😦 Sometimes I’m crafty, but this wasn’t one of those times! Fidget chose a red blanket at first, then chose a red and black blanket. I fell in love with the Moderne Baby Blanket from Mason Dixon Knitting so we scoured Ravelry together to find red and black blankets to give us ideas for 2 more colors. We settled on black, red, white and dark grey. So far I’m on block 6 and only messed up once, putting block 4 in the wrong place, but it will work out in the end I think with a bit of fudging. Sadly, I don’t have any new photos. Hopefully I’ll get something this week to share. It’s weird, but I don’t like talking about my craft projects without photos to share! Better get back to knitting. Happy Spring, Everyone! In my Rhinebeck Sheep and Wool Festival post I wrote about buying a Turkish Drop Spindle and some fiber with plans to learn to spin. Since then I have been working a little here and there when I find a few minutes to give it a try. I’ll admit that it’s not as easy as it looks…sometimes I feel like I need a 3rd hand, but it’s given me an appreciation for the art and a desire to branch out. 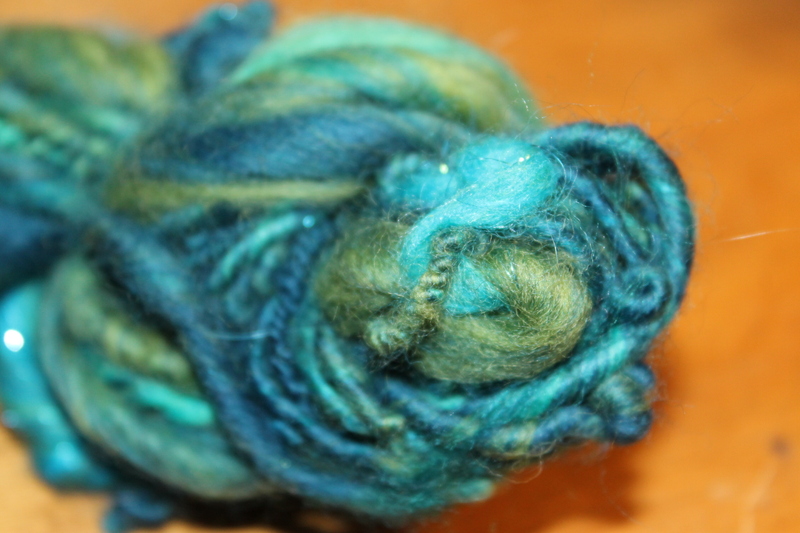 Now, I’m proud to present my first ever handspun yarn made with the batt from Loop Fiber Studio which is a mix of merino, bamboo, tussah silk and angelina that I purchased at Rhinebeck. 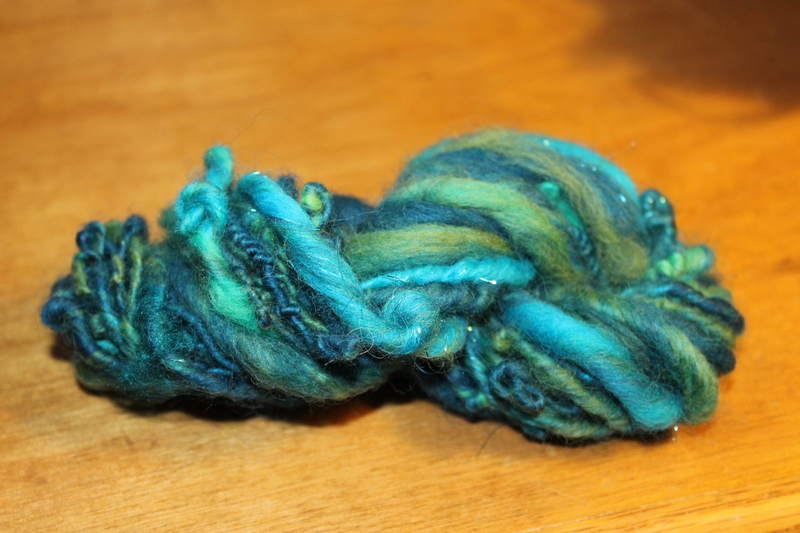 This skein weighs about 19gram (.6oz) (yes, it’s tiny, but it was just for practice) and is thick and thin in places. I’ve been told that if it wasn’t my very first attempt at spinning it might be worthy of selling in my Etsy Shop as an art yarn. I love the colors. Different shades of blue and green with some blue sparkly tinsel randomly throughout. It’s kinda of an arty type yarn with lots of sections of thick and thin spots. I’m excited to try my hand at a different type of wool, some unidentified pinkish wool that my awesome spinning friend Barbara of Kitty Mine Crafts (yes, go check out all her awesome spun yarn and wool fibers!) sent to me to practice with.